In an emergency, seconds can make all the difference. 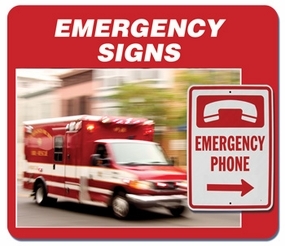 Proper emergency signs can quickly stir a person into action and can help save a life. Our emergency signs are eye-catching, clear and simple and ensure that no matter what the situation or emergency, instructions are always understood. Choose from signs that quickly pinpoint emergency phones, AED devices or building exits.